The study of neutron nuclear reactions and nuclear reactions in general is of paramount importance in physics of nuclear reactors. 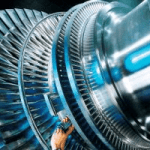 Progress in the understanding of nuclear reactions generally has occurred at a faster pace compared to similar studies of chemical reactions and generally a higher level of sophistication has been achieved. Shortly after the neutron was discovered in 1932, it was quickly realized that neutrons might act to form a nuclear chain reaction. When nuclear fission was discovered in 1938, it became clear that, if a neutron induced fission reaction produces new free neutrons, that each of these neutrons might cause further fission reaction in a cascade known as a chain reaction. Therefore the calculations of nuclear reactors are determined by the transport of neutrons, their interaction with matter and their multiplication within a nuclear reactor. 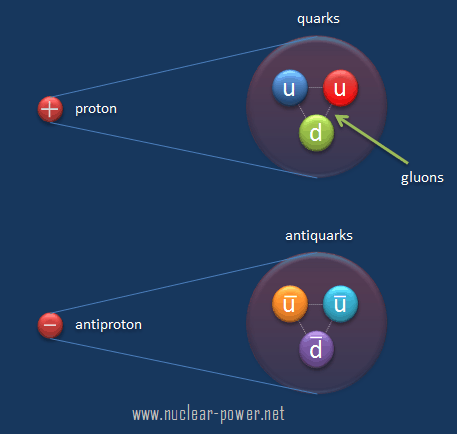 A neutron nuclear reaction is considered to be the process in which neutron interacts with a nuclear particle to produce two or more nuclear particles or ˠ-rays (gamma rays). Thus, a neutron nuclear reaction must cause a transformation of the target nuclide to another nuclide. Sometimes if a nucleus interacts with another nucleus or particle without changing the nature of the nuclide, the process is referred to a nuclear scattering, rather than a neutron nuclear reaction. In order to understand the nature of neutron nuclear reactions, the classification according to the time scale of of these reactions has to be introduced. 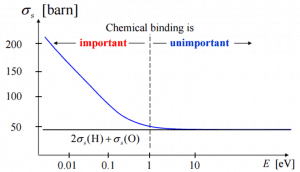 Interaction time is critical for defining the reaction mechanism. A projectile and a target nucleus are within the range of nuclear forces for the very short time allowing for an interaction of a single nucleon only. These type of reactions are called the direct reactions. Nuclear reactions, that occur in a time comparable to the time of transit of an incident particle across the nucleus (~10-22 s), are called direct reactions. Interaction time is critical for defining the reaction mechanism. The very short interaction time allows for an interaction of a single nucleon only (in extreme cases). In fact, there is always some non-direct (a multiple internuclear interaction) component in all reactions, but the direct reactions have this component limited. To limit the time available for multiple internuclear interactions, the reaction have to occur at high energy. The cross-sections for direct reactions vary smoothly and slowly with energy in contrast to the compound nucleus reactions and these cross-sections are comparable to the geometrical cross-sections of target nuclei. Very important feature and a direct consequence of the thermal equilibrium inside a compound nucleus is the fact the mode of decay of compound nucleus does not depend on the way the compound nucleus is formed. The large number of collisions between nucleons leads to the loss of the information on the entrance channel from the system. The decay mechanism (channel) that dominates the decay of C* is determined by the excitation energy in C*. These nuclear reactions are fast and involve a single-nucleon interaction. The interaction time must be very short (~10-22 s). 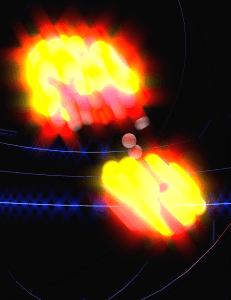 Incident particles interact on the surface of a target nucleus rather than in the volume of a target nucleus. A projectile and a target nucleus are within the range of nuclear forces for the time allowing for a large number of interactions between nucleons. Products of these reactions are distributed near isotropically in angle (the nucleus loses memory of how it was created – the Bohr’s hypothesis of independence). The mode of decay of the nucleus do not depend on the way the nucleus is formed. 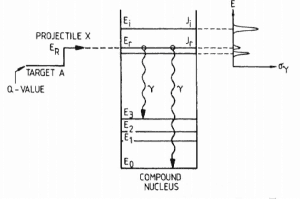 One the following statements is not typical for nuclear resonances? Nuclear resonance is one of the excited states of the nucleus formed by the combination of the incident particle and target nucleus. The narrowest resonances are usually the compound states of heavy nuclei (such as fissionable nuclei) and thermal neutrons (usually in (n,γ) capture reactions). 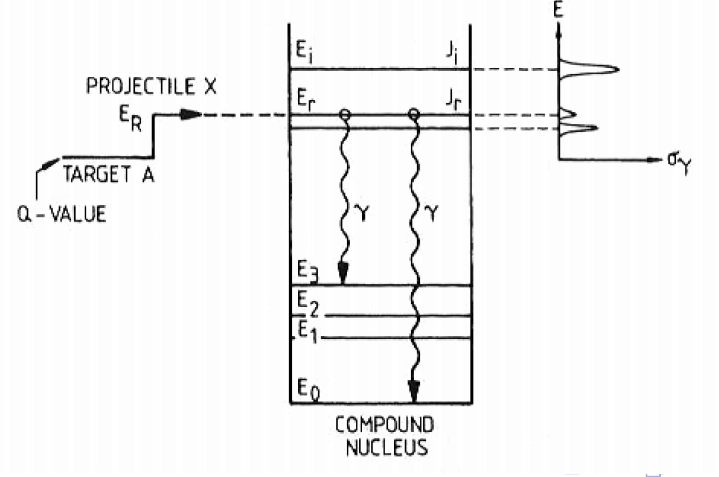 The observation of nuclear resonances is restricted to neutron-nuclear reactions. Explanation: The observation of resonances is by no means restricted to neutron-nuclear reactions. Raising the temperature of PWR fuel causes the fuel nuclei to vibrate more rapidly within their lattice structures. This causes an increase in resonance absorption of neutrons. 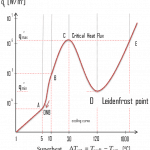 This phenomenon is known as the Doppler broadening of resonances, which is very important phenomenon, that improves reactor stability. Potential scattering. In potential scattering, the neutron and the nucleus interact without neutron absorption and the formation of a compound nucleus. In fact, the incident neutron does not necessarily have to “touch” the nucleus and the neutron is scattered by the short range nuclear forces when it approaches close enough to the nucleus. 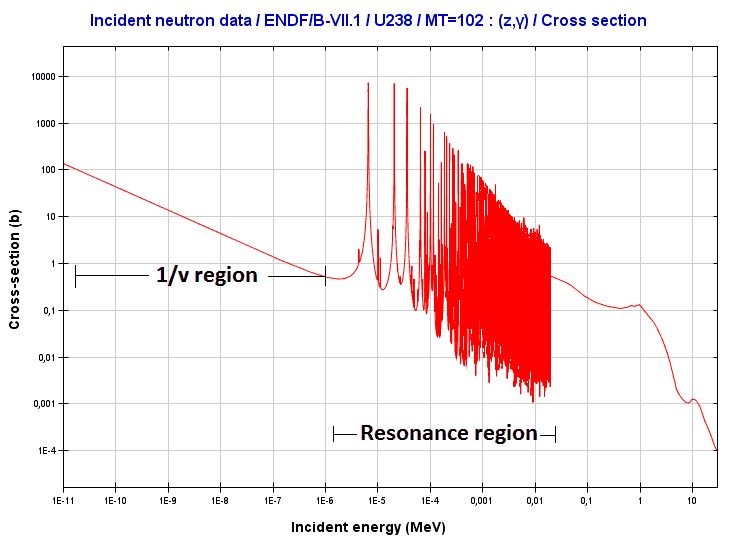 Potential scattering occurs with incident neutrons that have an energy of up to about 1 MeV. It may be modeled as a billiard ball collision between a neutron and a nucleus. Compound-elastic scattering. In some cases, if the kinetic energy of an incident neutron just right to form a resonance, the neutron may be absorbed and a compound nucleus may be formed. This interaction is more unusual and is also known as resonance elastic scattering. 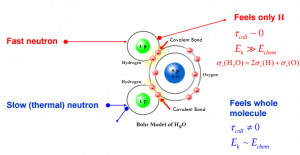 Due to formation of the compound nucleus, initial and final neutron are not the same. Elastic scattering (cross-section) of slow neutrons by molecules is greater than by free nuclei. 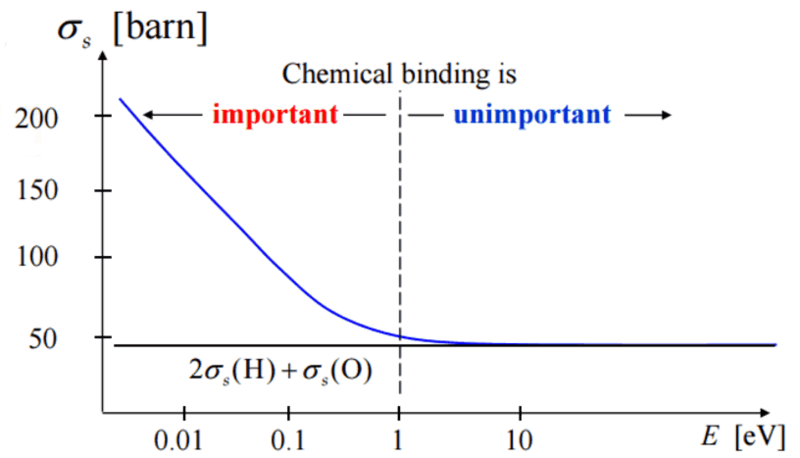 If the kinetic energy of an incident neutron is large compared with the chemical binding energy of the atoms in a molecule, the chemical bound can be ignored. If the kinetic energy of an incident neutron is of the order or less than the chemical binding energy, the cross-section of the molecule is not equal to the sum of cross-sections of its individual nuclei. During an inelastic scattering the neutron can be absorbed and then re-emitted. This reaction belongs to direct reactions. Explanation: The reaction occurs via compound nucleus. One the following statements is not typical for neutron inelastic reactions? For hydrogen nucleus as a target, inelastic scattering occurs only for low energies of incident neutron. Explanation: For hydrogen nucleus, inelastic scattering does not occur, because it does not have excited states. The most important neutron absorption reactions are divided by the exit channel into two types of reactions. One the following reactions is not an absorption reaction. 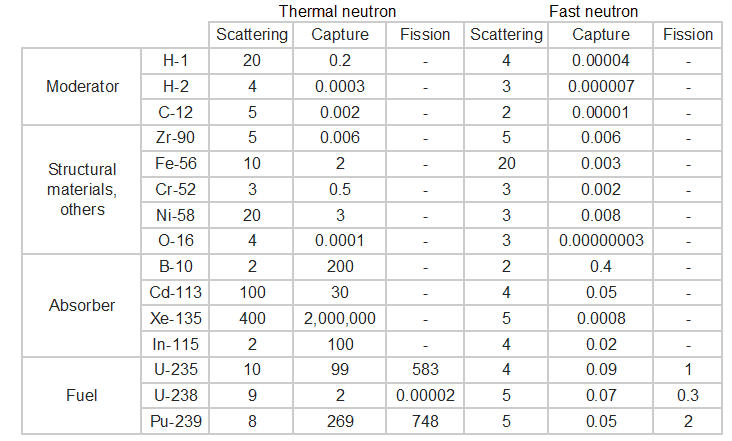 Sort the following isotopes according to the radiative capture cross-section for thermal neutrons from highest to lowest cross-section. For which neutron absorber is the following chart (cross-sections) typical (see the cut-off energy ~0.5 eV)? There is a cadmium cut-off energy (Cadmium edge) in the absorption cross-section. Only neutrons of kinetic energy below the cadmium cut-off energy (~0.5 eV) are strongly absorbed by 113Cd. Therefore cadmium is widely used to absorb thermal neutrons in a thermal neutron filters. What is not typical for (γ, n) reactions (production of photoneutrons)? (γ, n) reactions are threshold reactions. Photoneutrons do not contribute to neutron flux in a reactor when the reactor is in long term shutdown. These reactions play a significant role also in reactor kinetics and in a subcriticality control. The lowest threshold energy for (γ, n) reaction have 9Be with 1.666 MeV and 2D with 2.226 MeV. 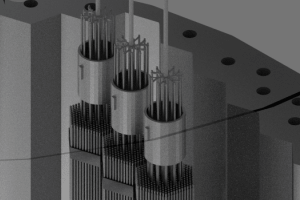 Explanation: Photoneutrons are usually major source in a reactor and ensure sufficient neutron flux on source range detectors when reactor is subcritical in long term shutdown. The most important neutron nuclear reactions in nuclear reactor physics are reactions of thermal neutrons with boron nuclei (rather with 10B nuclei). 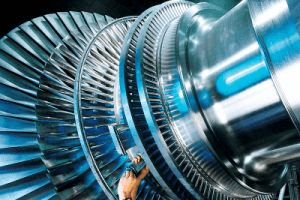 In nuclear industry boron is commonly used as a neutron absorber and a neutron converter. Which type of reaction is used in neutron absorbers based on boron (n + 10B)? Which of the following charged particle reactions is very important in reactivity control? 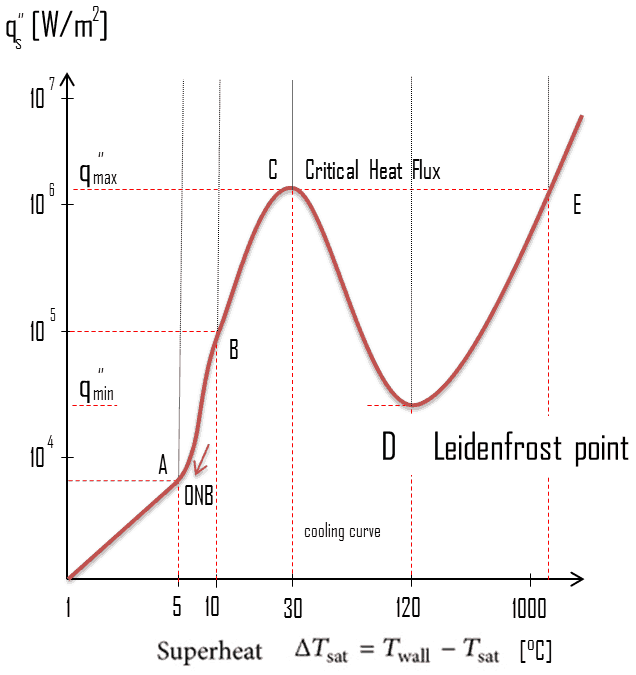 Explanation: Most of (n,alpha) reactions of thermal neutrons are 10B(n,alpha)7Li reactions accompanied by 0.48 MeV gamma emission. Therefore boron can be used as neutron absorber in case chemical shim, burnable absorbers or control rods. 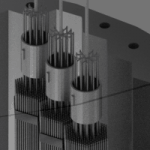 It can be also used as the neutron converter in neutron detectors, because its cross-section is very high and produces energetic alpha particles. Which of the following charged particle reactions is very important in radiation protection? Explanation: This nuclear reaction continually take place especially in the earth’s atmosphere, forming equilibrium amounts of the radionuclide 14C. In nuclear power plants, it is important especially from radiation protection point of view. The reaction is responsible for most of the radiation dose delivered to the human body by thermal neutrons. 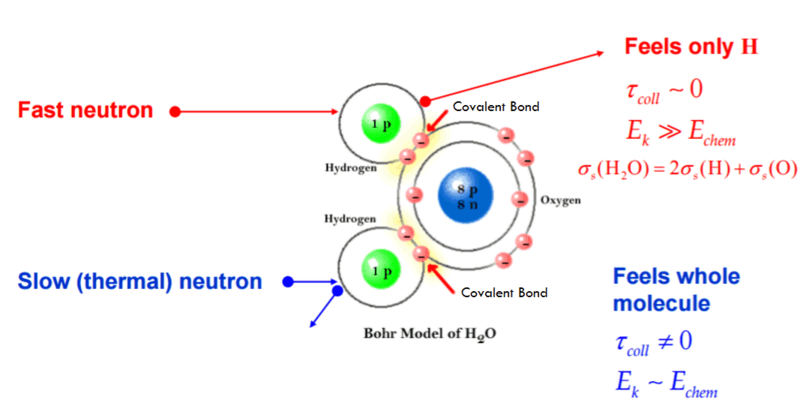 The nitrogen atoms are contained in proteins, therefore if the human body is exposed to thermal neutrons, then these thermal neutrons may be absorbed by 14N, causing a proton emission. Protons are directly ionizing particles and deposit their energy over a very short distance in the body tissue. the difference between the sum of the masses of the initial reactants and the sum of the masses of the final products, in energy units (usually in MeV). the difference between the sum of the electric charges of the initial reactants and the sum of the electric charges of the final products. the difference between the sum of the baryon numbers of the initial reactants and the sum of the baryon numbers of the final products.